Although efforts have been made to explain the behavior of heavy metals and refractory organic contaminants in aquatic habitats in the framework of known geophysical and geochemical processes, much remains to be learned about the role of bacteria in such behavior. 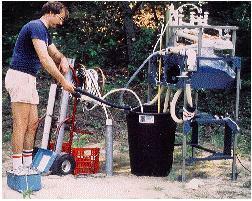 Of particular interest are bacteria-contaminant interactions in ground water. Due to the persistence of some contaminants in the subsurface environment and to increasing demand for both high quality ground-water and on-land disposal of toxic chemicals and radioisotopes, these interactions should remain important environmental problems for the next few decades. Since significant biotransformation/biodegradation of many environmental contaminants in aquifers and particle-laden surface waters can occur at particle surfaces, explanations for bacteria-contaminant interactions in such environments should take the presence of particles into account. Provide some of the microbiological information necessary for more realistic predictions of contaminant behavior in aquatic environments. Obtain information on specific mechanisms of interactions between environmental contaminants and aquatic bacteria, taking into account adsorption, active uptake competition, biotransformation reactions, interactions with extracellular polymers, effects of nutrient and physicochemical gradients, and effects of particle surfaces. Investigate the effect of nutrient and physicochemical conditions upon subsurface transport of bacteria since the role of bacterial transport upon the fate of environmental contaminants in ground water is unknown. The complex nature of interactions between bacteria and organic and inorganic contaminants in particle-laden aquatic habitats necessitates an approach involving both field and laboratory studies: (1) Study of the influence of surfaces and interfaces upon microbial heterotrophic activity in particle-laden aquatic environments, including fresh-water aquifers. (2) Study of the effect of organic contaminants upon the distribution, transport, and activity of the bacterial population in ground-water habitats. These studies will be performed with Richard Smith, Water Resources Division (WRD), Boulder. (3) Flow-through column experiments to assess the role of adherent bacteria upon the mobility of selected heavy metals and toxic organic compounds in simulated aquifer environments. Columns will be used to investigate factors affecting the movement of bacteria through porous media. (4) Microcosm studies of bacteria-contaminant interactions.